Grating spectrometers for x-ray astronomy usually consist of an x-ray telescope (grazing incidence mirrors – i.e. 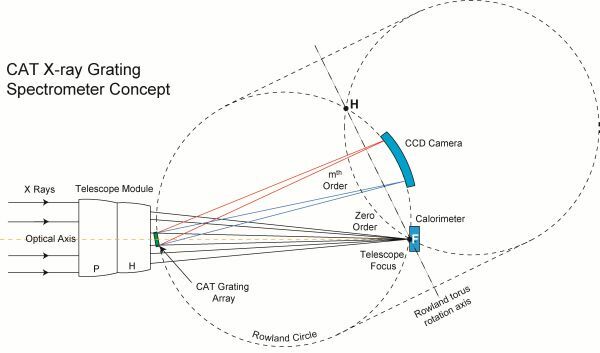 the x-ray “lens” – that focus light from infinity onto an imaging detector in the telescope focal plane), an objective grating array just downstream of the telescope mirrors, and a dedicated detector readout array that collects the x-ray spectra generated by the gratings. The primary goal of the spectrometer optical design is to maximize the spectral resolving power R over the wavelength band of interest. Since the invention of the Critical-Angle Transmission (CAT) grating we have developed and refined several new x-ray grating spectrometer (XGS) optical designs, based on existing transmission and reflection grating spectrometers, in collaboration with others at MKI. The designs all take advantage of the blazing property of CAT gratings, the so-called sub-aperturing technique to narrow the telescope point-spread function (PSF), and a tilted Rowland torus design. A CAT-XGS has the added advantage that it is transparent for high-energy x rays, which can then be collected by a microcalorimeter at the telescope focus to perform high-energy imaging spectroscopy simultaneously with CAT grating-based soft x-ray spectroscopy. Lynx – X-ray Observatory Mission Concept for 2020 Astrophysics Decadal Survey. A CAT-XGS was also part of the Gen-X vision mission study. Extensive details about the science case for a CAT-XGS, performance predictions, comparisons with existing missions, and response files can be found here. Copyright (unless stated otherwise): Space Nanotechnology Laboratory, MIT Kavli Institute for Astrophysics and Space Research, Massachusetts Institute of Technology, Cambridge, MA 02139, USA.